I lectured in Art & Design for fourteen years at a F.E. level specialising in fashion, textiles and design, and taught City & Guilds Embroidery and Design for ten years. I've been a member of the Embroiderers Guild for more than twenty years, and am a past Chairman of Darlington's E.G. In 2008, I published my first book "Get Plastered: Plaster, Print and Stitch", a how-to book showing a variety of exciting ways to create surface texture on fabric. This was followed in 2012 by "Get Stuffed: Shape, Stuff and Stitch" which presents a fresh approach to quilt and applique techniques. I mentor students from my studio in Darlington, in the North East of England, and I run workshops and exhibit regularly throughout the country. It was the first in the series of two day sessions I’m running at the studio in Darlington for both the fearful and the intrepid. Time to play, ask questions, explore, discover, have your hand held if need be and unveil the potential artist in you. 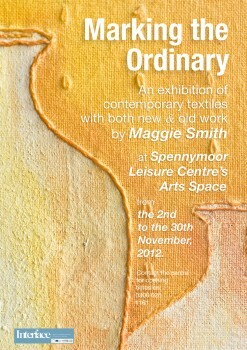 Already looking forward to the two day Print sessions in November! Emulsion paints, watercolour, acrylic, oil and graphite mark making. “This was one of the most interesting and inspirational workshops I have ever completed. Taking mark making to a new level, Maggie’s superb tuition guided me through a series of techniques that made sense of the basics completed in the City & Guilds Level 2 design for craft course. 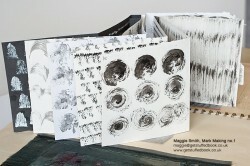 Indian ink, poster paint and white acrylic mark making. Encouraging me to explore and further develop my creativity, the possibilities of two colours, rubbing templates, papers and threads have opened up many new avenues. I came away with a finished piece of work I am proud of and the starting point for many more creative projects. Maggie was thoroughly prepared for the workshop, providing all the materials required and always ready to answer questions. The workshop was excellent value for money.” P.W. Mark Making 1. 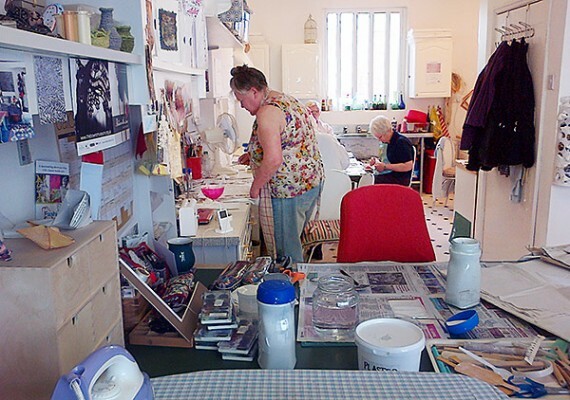 During Autumn 2014 I will be running a series of workshops from my studio in Darlington DL1, County Durham. In a pleasant, calm environment you will have individual attention, clear and supportive instruction and be encouraged to learn or to extend skills using a chosen source of inspiration. The two day workshops allow you to have extended development time to discuss and evaluate outcomes and to explore areas in response to unexpected discoveries! Considered outcomes from each workshop will provide lots of ideas for future projects in any medium. 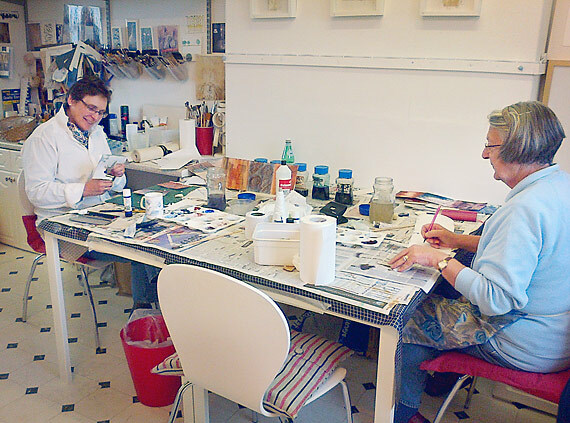 A Get Plastered workshop in progress at my studio in Darlington. There has been so much interest in the ‘Get Plastered’ workshop that I am offering another date this autumn, so if you missed out last time please book early to avoid disappointment. A fun mixed media approach using a plaster and paint mixture to create texture and line through mark making, on both paper and fabric. Hand stitching may be experimented with before and after exploring processes using shape and texture. No previous experience necessary. £50 plus £2.50 materials. I find in my travels that there is a fear of drawing out there and I’m often told by students that they “can’t draw”. 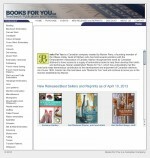 I am also frequently asked where I get my ideas from and how I get started. Bearing all this in mind I have put together a series of two day workshops working with simple mark making techniques and easily available materials, looking at a range of creative answers to some of these unanswered questions. medium to generate new paths of inquiry. £90 plus £5 materials. of unique design references. £90 plus £5 materials. materials. £90 plus £5 materials. I’m an enthusiastic tutor with over twenty years of experience and welcome beginners, or those who would like to revisit and refresh, to develop new ideas and working processes. So if your interest has been piqued you can book your place by downloading and filling in this Booking Form – Autumn 2014 then posting it, along with your payment, to me at the address provided on the form. You can also email me the completed form and I will invoice you through Paypal. A bit like Sandra Bullock (in Miss Congeniality) my wish for 2014 would be for world peace, but the news has been almost as dire as the weather. 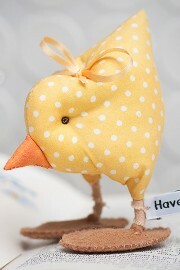 However, my new sunshine alarm clock wakes me up to increasing light, bird song and the sound of flowing water. I am wondering whether it’s the light or the water which ejects me from my bed to the bathroom! There has been a steady flow of book orders for both Get Plastered and Get Stuffed since Christmas through in to the New Year, perhaps from folk spending present money which is lovely. As I delved into the last box of Get Plastered books to fulfil a postal order, I realised that there are only 25 left! So if you would like a copy of Get Plastered from the last 25 books remaining, order now and if you would like it signed – just mention that as you order. This has prompted me to think about the possibility of a third book. Gestation is usually about two years especially as at the moment I have several ideas to explore and can’t say which path I’ll tread. I will let you all know as soon as there is news to report. For a number of weeks I have been mostly making cushions (and curtains) which has encouraged a creative emergence from dark, dull days. This has been followed by happy hand stitching with members of the Durham Embroiderers’ Guild at The World Heritage Visitor Centre in Durham City and the hatching of an Easter chick! After hibernating and dusting off my domestic goddess (ha!) over Christmas, I am getting back into thinking and planning what comes next. Meanwhile, I have decided to concentrate on sorting out more items to go in the shop and am in the process of getting the various stuffed birds online, the first of which, the Dot Spot Forget-me-Nots are busily ‘chirping’ there already. 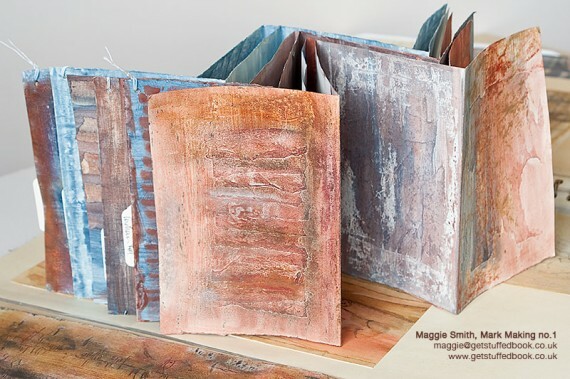 If you join the Maggie Smith Contemporary Textiles Facebook group you’ll be kept up-to-date with my goings on, and you can also follow me on Pinterest to see what has interested me or is currently inspiring me. I’m very pleased to announce that would-be shape, stuff and stitchers in Canada and Australia can now purchase both my Get Stuffed and Get Plastered books directly from local outlets. Books For You (Canada) and Canberra Needlework (Australia) both now hold stock of my books, which should mean improved delivery times as orders no longer have to traverse earth and sea to reach their destination. Of course, should you want to order from us then that will still be possible too. We’ve had a couple of queries about payment, and whether when paying for an item you must have, or sign up for, a PayPal account first. PayPal don’t make it as obvious as it should be, but you do not need to do this. If you click the option called “Don’t have a PayPal account?…pay as guest” (circled in red in the image above), you will then be shown your shipping details etc and be able to pay using your credit or debit card, without having to log in or sign up to PayPal. Having extended my studio in Darlington over the last few months, I am delighted to be able to offer a number of workshops there covering a range of topics. Spaces are limited so please get in touch and book early. A fun mixed media approach using a plaster and paint mixture to create texture and line through mark making, on both paper and fabric. Hand stitching is experimented with before and after exploring processes using shape and texture. No previous experience necessary. Expressing shape and form through drawing directly with stitch – a course to develop observation skills and confidence with your needle and thread. May be approached and enjoyed on all levels. Developing and exploring simple stitches inspired by a well known artists’ work to create your own stitch dictionary as a resource when making new work. For all levels of expertise. Making dolls from simple shapes to decorate and embellish with scraps of precious materials, beads and found objects creating unique characters. Basic machine and hand sewing skills are required. Groups will be small with plenty of support and encouragement. Workshops will be from 10am – 3.30pm on week days and will cost £35. Tea, coffee and biscuits will be provided. Please bring your own lunch. Students need to be aware the studio is up a flight of stairs. If you would like to know more or have any queries please email or ring me with your details. If you (like me) have bags of delicious fabric remnants stashed away in anticipation of that “special project”, but aren’t sure what that may be, then this month’s Stitch magazine may have the answer. 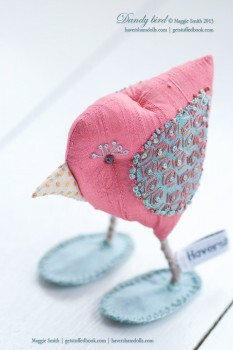 I explain in the article entitled “Dandy Birds” how to make use of these fabric remnants by constructing your own lovely stuffed bird for a gift, or simply as a keepsake that will make you smile. Stuffed fabric “Dandy Bird” by Maggie Smith for “Stitch” Magazine issue 81, with Tete-de-boeuf stitch detail on wing. When I discussed an article for “Stitch” magazine with Kathy Troup (Stitch’s Editor) she was adamant she wanted “birds with attitude”, from my book Get Stuffed: shape, stuff and stitch, and after seeing Kathy’s plea to readers for articles showing unusual stitches or using stitches in an unusual way, I decided I wanted these birds to be colourful with more decorative stitching. And so the “Dandy Birds (all dressed up and nowhere to go)” were born. I spent some time furtling for fabrics in bags and boxes, as one does, and decided here at last was the opportunity to use some of those treasured scraps of silk I had been saving. The Dandy Bird’s wings are hand embroidered with five of my favourite stitches: Tête-de-Beouf stitch (chosen because the name tickled me, and it’s such a pretty stitch), Straight stitch (for its simplicity), Pistil stitch (for its resemblance to feathers), Fly stitch (for its trellis effect), and Oyster stitch (another pretty stitch), all with French knot embellishments. The eyelashes are embroidered with Fly stitch, and all hand stitching was done with space dyed silk threads. 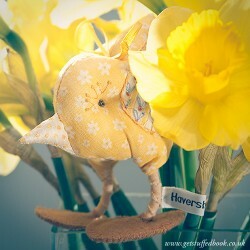 I think they will make delightful Easter presents and I hope you enjoy making them. Happy stuffing! These stuffed birds are in a direct line of descent from the “birds with attitude”, with inspirations from the “decorative bird”, both designed for my latest book Get Stuffed, shape, stuff and stitch. Also part of this flock are: the “Bovver Birds with Big Feet” (made from hand painted and stuffed calico), the Dot Spot Forget-me-Not Birds and kits which appeared last March 2012 at the NEC Fashion Embroidery & Stitch, the Floral Belle Birds made from Liberty lawn fabric bought at the show, and the Christmas Bell Birds made for the festive season. I’ve had several queries regarding Fair Use of the patterns and instructions. So to clear things up: please feel free to make as many birds as you want for yourself, or as gifts for friends and family, but please do not sell or reproduce the patterns, instructions, or the birds (whether as kits, or as finished products) as the copyright resides with myself. I will be in Harrogate for the Knitting & Stitching show for an informal demonstration at the “Artists in Action” studio space on the mornings of Thursday the 22nd, Friday the 23rd, and Saturday the 24th of November. Both my books will be available to purchase there too, so come along and say hello! 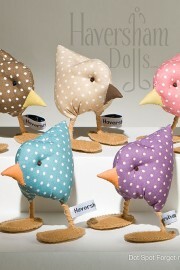 “Dot Spot” birds, as they were affectionately named by my husband, Mike, were launched at Fashion, Embroidery & Stitch at the NEC, Birmingham and the kits with instructions are now available in our online shop. Based on the ‘Birds with Attitude’ from the ‘Get Stuffed’ book, these stuffed fabric birds were designed to be simple to stitch using materials that are easy to access. Ready made “Dot Spot” birds, boxed and gift wrapped, will be online soon for those that would like to purchase one handmade by myself. However if you can’t wait, then birds can be purchased from Crushed Chilli in Durham, and also the Porta Dextra gallery in York has just received their first shipment of “Dot Spots”. 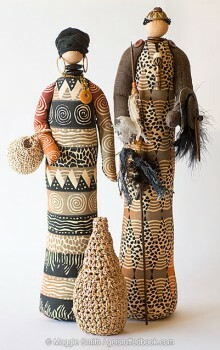 The African Stump dolls from the same book and shown in the image on the left, can also be viewed online at The African Fabric shop and in their newsletter. The African Fabric shop stocks the fabric which was used to make the dolls, plus African beads and other delights. In other news, unfortunately I won’t be at the Alexandra Palace for the Knitting & Stitching Show this week (11th – 14th October), but you will find my books “Get Stuffed” and “Get Plastered” there on sale at Art Van Go and the Embroiderers’ Guild Bookshop.